Saturday, December 6, 8 p.m. (doors open), Ancient Future Trance Trio with Matthew Montfort (scalloped fretboard guitar), Salah (Arabic percussion), and Alan Tower (didjeridu), The Groove Garden, "Marin's Monthly Dancetribal Gathering," 2398 Sir Francis Drake Blvd. Fairfax, CA. Adm: $15.00 ($12.00 before 9pm) . Contact The Groove Garden at 415-488-1967 or email gatheringforgood@yahoo.com. Features the first public performance of a new raga discovered by Matthew Montfort based on the melodic elements of the guitar solo from Jimi Hendrix's Purple Haze. Wednesday, October 1, 12 noon to 1:30 p.m., Ancient Future World Jazz Trio featuring Matthew Montfort (scalloped fretboard guitar), Patti Weiss (violin), and Arshad Syed (tabla),San Francisco Jazz Festival, Levi's Plaza, The Embarcadero at Battery St., San Francisco, CA. Contact San Francisco Jazz at 415-398-5655. Sunday, September 21, 1-4 p.m., Ancient Future Duet featuring Matthew Montfort and Salah, International Day of Peace Celebration of the San Francisco Artist Guild, Civic Center, San Francisco, CA. Contact Bill McCarthy at 415-255-8683. Saturday, August 9, 8 p.m., Ancient Future Arabic Fusion Quartet with Georges Lammam (Arabic violin), Matthew Montfort (scalloped fretboard guitar), Doug McKeehan (keyboards), Salah (Arabic percussion), Gateway Healing Arts and Music Faire, Gold Country Fairgrounds, Auburn, CA. More info. Contact: Gateway Healing Arts at 530-886-0690. Sunday, July 27, 2:30-4:00 p.m. Ancient Future Duet featuring Matthew Montfort and Salah, Concerts in the Park, Central Park, Kiely Blvd. near Homestead, Santa Clara, CA. Contact: City Manager's office 408-615-2210. Saturday, July 12, Ancient Future Duet featuring Matthew Montfort and Emam, Sada Shiva Dham, Vrijenbergweg 60-62, 7371 AB, Loenen, Holland. More info. Contact Bhaskar at 31-55-505 2871 or email info@babaji.nl. Saturday, July 5, Ancient Future Duet featuring Matthew Montfort and Emam, Festival Internacional de la Guitarra, Salou, Tarragona (near Barcelona), Spain. Friday, June 20, 8 p.m., Ancient Future: Matt and Patti 3 featuring Matthew Montfort (scalloped fretboard guitar) and Patti Weiss (violin), and Arshad Syed (tabla), UCO Lick Observatory, Main Hall Fair, Mount Hamilton, CA. Contact: Lotus Baker at 408-274-5061. Saturday, June 14, 3:30 p.m., Ancient Future Duet featuring Matthew Montfort and Salah, Health and Harmony Fair, Sonoma County Fairgrounds, (directions), Santa Rosa, CA. Contact Health and Harmony at (707) 547-9355, email info@harmonyfestival.com, or visit Health and Harmony Fair. Friday, June 6, 7 to 10 pm, Ancient Future Planet Jammin' World Fusion Music Festival, featuring the Ancient Future Arabic Fusion Quartet with Georges Lammam (Arabic violin), Matthew Montfort (scalloped fretboard guitar), Doug McKeehan (keyboards), Salah (Arabic percussion), and Sapphira (world dance), the Ancient Future Sitar/Guitar Jugalbandi, Indian classical and fusion with Pandit Habib Khan (sitar), Matthew Montfort (scalloped fretboard guitar), and Arshad Syed (tabla), the Ancient Future World Jazz Trio with Matthew Montfort (scalloped fretboard guitar) and Patti Weiss (violin), Arshed Syed (tabla), and special guest Alan Tower (didgeridu), and the Ancient Future Trance Songs Ensemble featuring Irina Mikhailova (vocals), Matthew Montfort (scalloped fretboard guitar), Doug McKeehan (keyboards), and Salah, Playhouse of San Anselmo, 27 Kensington Ave, San Anselmo, CA. Contact: Gordeo Video at 415-485-4437. Tickets $20 at the door. 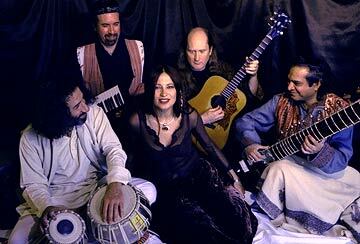 Saturday, May 10, 8 p.m., Ancient Future Arabic Fusion featuring Georges Lammam (Arabic violin), Salah (Arabic percussion), Irina Mikhailova (vocals), Matthew Montfort (scalloped fretboard guitar), and Doug McKeehan (keyboards), Music Recital Hall, California State University Sacramento, Sacramento, CA. Adm $10 gen., $5 student, senior. Tix: www.tickets.com or contact: CSUS Central Ticket Office at 916-278-4323. Lark In The Morning World Music & Dance Celebration August 1-9, 2003, Mendocino, CA. Matthew Montfort of Ancient Future teaches World Rhythms For All Instruments: increase your rhythm skills by learning rhythms Of Africa, Bali, And India, World Music For Guitar: explore Indian Raga and other world music forms on guitar. Register Online. Camp fills up quickly.